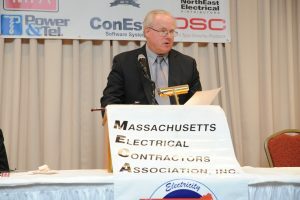 Since 1937, the Massachusetts Electrical Contractors Association (MECA) has been defying industry standards by fostering this type of communication and servicing the needs of electrical contractors by providing services ranging from Massachusetts codebook publications to business advice. MECA, currently with over 360 member-contractor companies, has grown in number and strength, becoming a chain forged from a valuable network of electrical contractors. MECA provides a forum in which questions can be answered, concerns can be voiced, and members can benefit from the guidance of industry leaders. MECA’s goal as a value-added resource is to provide an advantage to each member’s operation and bottom line through communication, education, and legislation. We ask our members: what are the three biggest challenges they face to make their business even more profitable? And then we aggressively address those issues on a daily basis. MECA works hard to deliver a strong voice to the needs of electricians – be they a one-man or one-hundred-man shop in the electrical industry. We keep members up-to-date with our legislative initiatives that protect the rights of contractors. We provide excellent insurance rates that cover health, dental, disability, worker’s compensation, and general liability. Also, we offer a variety of educational training programs that help our members renew their licenses and tap into industry niches. Many of MECA’s past and present members were instrumental in promoting the Statewide Electrical Permit, the Massachusetts Electrical Code, Insurance Coverage Requirements, C&D Licensing, and Code Interpretation. Our members sit on the Board of Examiners of Electricians, the Mass Code Advisory Committee, and the Fire Protection/Fire Prevention Advisory Board among others.